Home » Directories » HVACR Directory » BITZER US Inc.
BITZER US, Inc. provides OEM and aftermarket customers with Screw Compressors to 320 HP, Recips to 50 HP, Scrolls to 40 HP and ASME Shell and Tube Heat Exchangers. Description: BITZER, a leading global compressor manufacturer, has overhauled its popular, free P-T app. The new digital refrigerant reference tool for iOS and Android smartphones is available now. It boasts a user-friendly and straightforward interface and is equipped with new functions and a fresh design. Everything at a glance The app`s intuitive operation makes it simple to read the saturation temperatures and pressures of various refrigerants. Additional new features include the display of dew point and boiling point temperatures for refrigerants with temperature glide and convenient filter functions, including one for natural refrigerants and another for refrigerants with low global warming potential (GWP). The app also provides users with access to the 19th annual edition of BITZER`s refrigerant report which provides insight into global regulations, new refrigerants and their practical applications. The BITZER™ refrigerant app is now available for download from all stores. Description: The whole world of BITZER in your pocket: with the new, free BITZER SPOT mobile app, customers can easily check whether any BITZER product is genuine. Users simply have to scan the QR code on the products. BITZER customers then have the best possible protection from fake products. 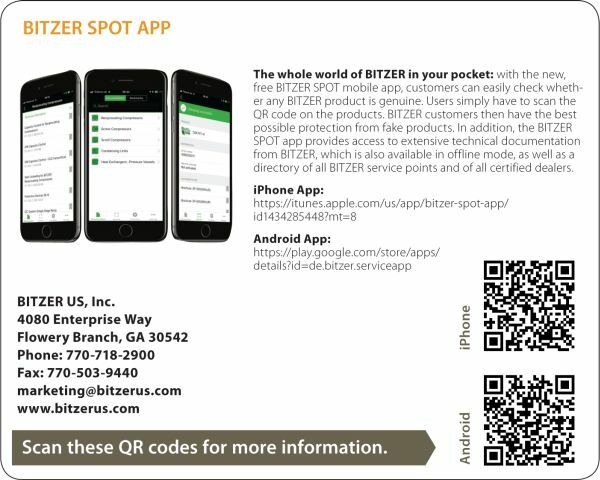 In addition, the BITZER SPOT app provides access to extensive technical documentation from BITZER, which is also available in offline mode, as well as a directory of all BITZER service points and of all certified dealers. ASME Certified Pressure Vessels. BITZER US manufactures Shell & Tube Heat Exchangers (Condensers from 5-500 tons/ Evaporators from 30-500 tons/ Flooded Evaporators from 90-500 tons), Receivers CO2 and Ammonia applications, and Oil separators. Our condensers feature internally and externally enhanced tubes in copper and copper nickel for standard and marine applications. End covers are removable for mechanical cleaning. Tubesheets and heads are coated ensuring corrosion protection. Our Evaporators feature U-tube enhanced design to minimize leaks. Click here to view more information about this product. GSD Series R410A Scroll Compressors. BITZER U.S. manufactures Scroll Compressors at its plant in Syracuse, NY. With a range of models from 10 – 40 HP, the GSD series provides OEMs the highest efficiencies and lowest sound levels in their class. Click here to view more information about this product. ECOLINE Semi-Hermetic Reciprocating Compressors. BITZER U.S. manufactures compressors from ½ - 50 HP at its Georgia campus. Recognized for their class leading efficiency and low sound levels, BITZER recips have a wide presence in supermarket and ultra-low temp refrigeration and sub and transcritical CO2 applications. Click here to view more information about this product. BITZER’s CSVH SCREW COMPRESSOR WITH INTEGRATED DRIVE UL APPROVED FOR U.S. Imagine a positive displacement Screw Compressor with integrated VFD that rivals the IPLV performance of complex, oil-less centrifugal compressors. BITZER’s awesome CSVH series has UL for the U.S. market and is available in 125, 160 and 200HP sizes. Click here to view more information about this product. BITZER Digital P-T Refrigerant App. The new digital refrigerant reference tool for iOS and Android smartphones is now available. It boasts a user-friendly and straightforward interface and is equipped with new functions and a fresh design. Click here to view more information about this product.